Pour tomato juice in your temp-tations® pitcher. Stir in horseradish, Worcestershire sauce, celery salt, garlic salt and Tabasco. To serve, mix celery salt and kosher salt on a small plate. Dip the rims of 4 (8 ounce) glasses in water and then roll in the salt mixture. Fill each glass to the top with ice. Pour in 2 ounces of vodka followed by your Bloody Mary mix. 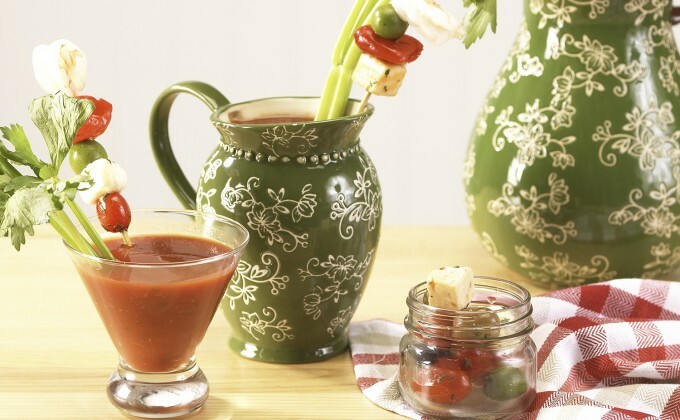 Place one celery stalk in each glass along with optional skewers and serve.